As of May 2, I completed four months on the GAPS Diet and one month since restarting GAPS Intro. After this past month, I can safely say that this is the hardest and the best thing I have ever done for my health. When I restarted GAPS Intro on April 3, 2015, I resolved to move very slowly. I not only had made myself sick during the third month of GAPS and needed to heal, but I was reacting to something that I thought was safe. I was also gaining weight and was almost always bloated, so I needed to work on that. I restarted GAPS nightshade-free, low-FODMAP, and with no intention of introducing dairy (besides ghee) or nuts for quite some time. I experience some pretty intense die-off this time around. Not only was I fatigued, but this time I was experiencing digestive die-off, too. This was new, and confirmed that there was something going on beneath the surface. Soon my bloating and weight was back down to where it should be, and I felt good about that. My skin was clearing and my moods were stabilizing. However, I was still greatly fatigued and there were a few other issues both my husband and I were dealing with. So we made a huge decision: We moved in with his parents. We now have access to the outdoors and sunshine, we are building an organic vegetable garden, and we are saving a ton of money as we prepare to move to Germany. I do get much pretty pictures here. This is a Stage Two meatball soup with egg yolk and chives added. Sadly I reacted to the meatballs. We have been living here about 3 weeks and are both feeling much healthier. It is not without its trials, however. I live in constant fear of cross-contamination and we both struggle with the stress of being surrounded by foods not even my husband is willing to eat. I have had quite a few mental health breakdowns since arriving here as a combination of both stress and die off. But we are both adjusting and it looks like this will work out for the next four months. Intro itself has been progressing slowly. I have had unexpected reactions, and one night I even got so sick I had to go back to stage one for a day. I have reintroduced ghee and egg yolks with no problem at all, and I seem to tolerate foods that are considered “caution” foods on the low-FODMAP diet as long as I keep the portions down. I can eat half an avocado a day as far as I can tell. However, I also discovered what may be a minor sensitivity to egg whites. I got weird reactions when I first tried them. Two weeks later I tolerated one soft boiled egg just fine, but when I tested a second I experienced some GI symptoms. I also found what was triggering my acne before: ground pork seems to be doing the job. I haven’t tried pork roast yet. I do however tolerate lard just fine. Finally, I made myself a “Thanksgiving in April” dinner, which was delicious but it and its leftovers made me bloat every time. So unfortunately it looks like I may have a FODMAP problem, and I will continue to limit them and avoid garlic and onions for a bit longer. Sad day. Thankfully garlic-infused ghee is a thing. 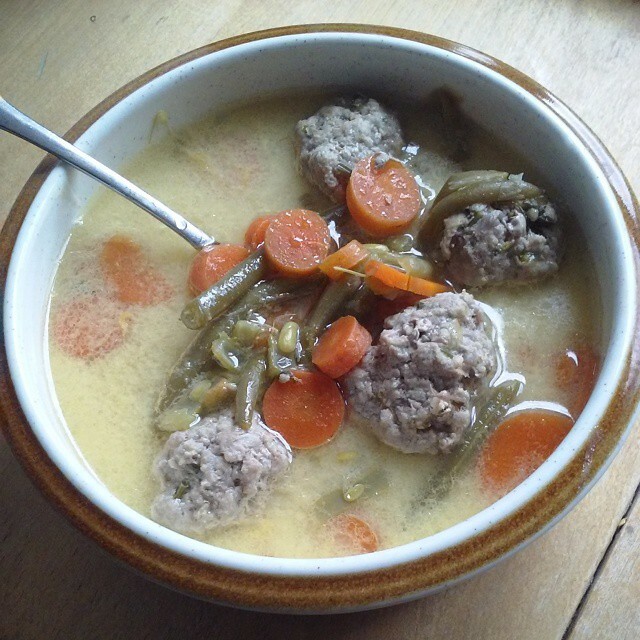 A standard, low-FODMAP chicken soup with ghee added. 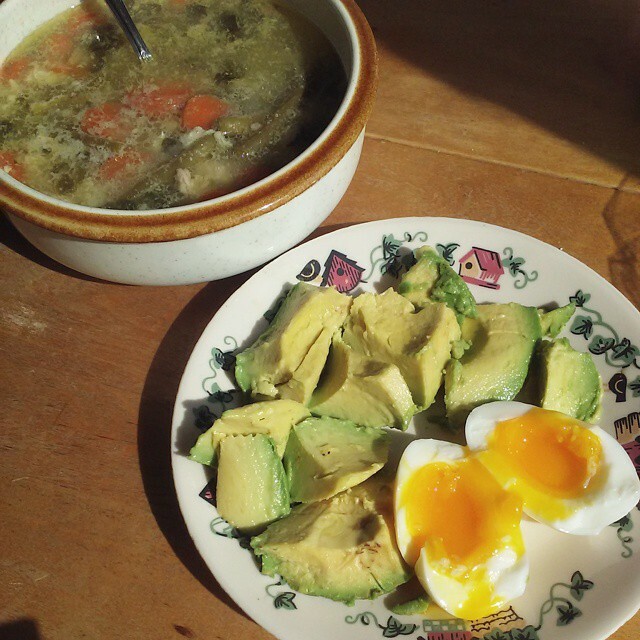 One soft boiled egg and half an avocado, as I know I can tolerate. One month into this second take of GAPS Intro and I am just nearing the end of Stage Three – and that is without adding any nuts. I am currently experimenting with sauerkraut and other fermented vegetables, and it is too soon to tell how that is going. My acne is clearing since the last time I ate ground pork, and I am still searching for my limits to help keep my bloat down. In the next few days I plan to move to Stage Four and spend the next month continuing to enjoy soups, but also testing roasted meats and raw vegetables as I feel like it. Most of my time, however, will be continuing to play with egg whites and FODMAPS to determine my tolerance. I think the most importance lesson I learned in this past month, however, goes beyond food. It is a need for me to monitor my mental health and really put an effort into nurturing it. I trust that GAPS will help heal my mental problems, but I need nourish myself with more than food. My husband is working on my self esteem and helping me disconnect my break outs from my self worth. I have learned to view my stomach as a learning tool, not my enemy. I have no idea what cycle day I am on; although I continue to chart, not looking at what day it is relieves the pressure of delayed ovulation. I am trying to make an effort to spend time outside and ground myself every day, and I know that I need to move more. I know I have a long ways to go with my mental health, and some days I lose control of my emotions. But I am trying to become more aware and more active in healing my mind and spirit as well as my body. With time I know I can beat this. 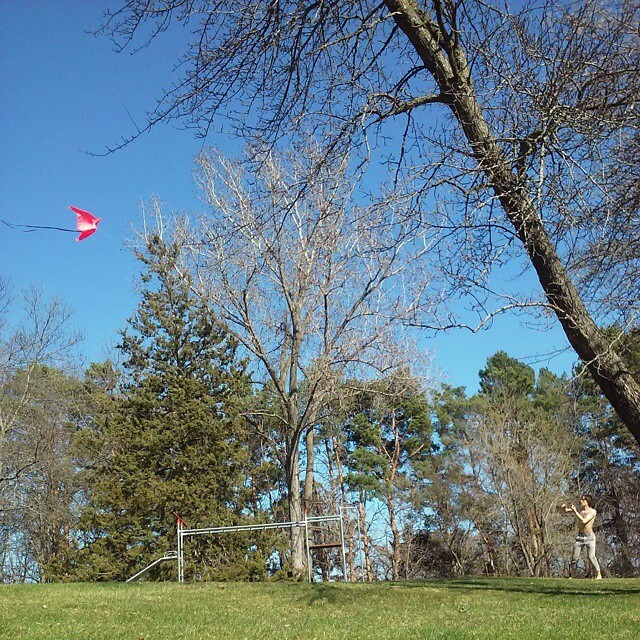 My husband flying a kite in his parents backyard. I was so happy and stress free this day as I lay in the grassed and soaked up the sun. It’s interesting that you wrote about bloating on GAPS. I had a similar experience. Never before do I remember being bloated in my life. Mid-way through Gaps I started experiencing bloating and still do sometimes. Things like kombucha and fruit can make me feel really bloated. I wonder if it’s due to a re growing of good bacteria that reacts strongly when some sugars are re-introduced? I don’t have the answers for myself even but thanks for sharing! Interesting. Thanks for sharing your experience. I’m sure you are on the right track – that our gut bacteria becomes much more sensitive through the healing process.